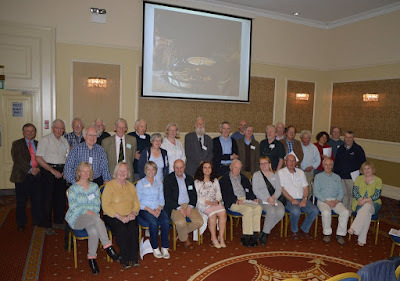 Our summer 2015 conference Farming and local economies today and yesteryear in north-eastern Ireland was held on 5–7th June, 2015 in Armagh. This conference included a full day of lectures plus two days of fieldtrips. Various photos and reports have now been uploaded - here are some of the best! The conference organisers were Professor Jim McAdam and Frances Ward, Agri Food and Biosciences Institute, Loughgall, Co Armagh. 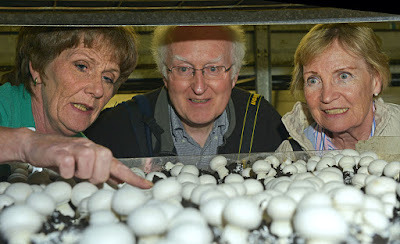 Thanks are also due to the AFBI staff: David Johnston, Grass Breeder and Head of Station, Mairead Kilpatrick, Mushroom scientist, Sean Mac an tSaoir, Pomologist, Linda Walsh, Biomass and renewable crops scientist, Paul Watts, Potato Breeder. A very big thank you as well to Dermot Morgan of Bramley Farm for the delicious apple juice and apple tart! The conference extended over two and half days, starting early on Friday afternoon, 5 June and ending in the late afternoon of Sunday, 7 June. 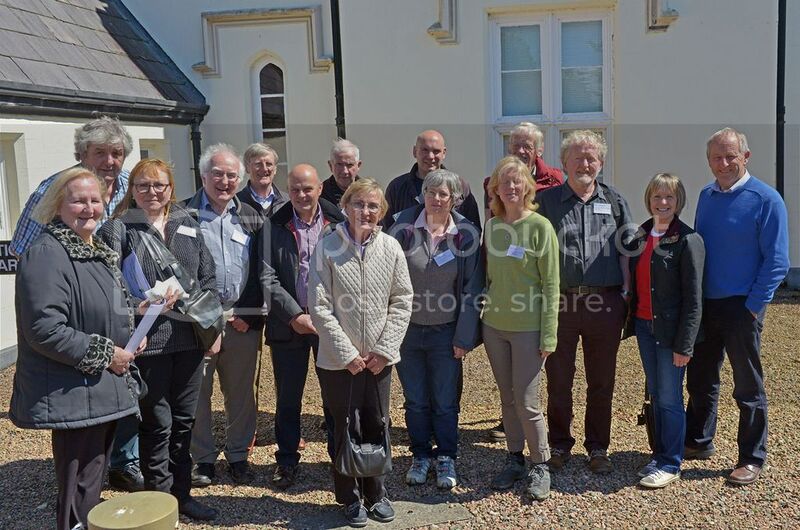 Participants met at the Manor House, Loughgall, north of Armagh city, in Co. Armagh. This historic building has been in the ownership of the Department of Agriculture and Rural Development since 1952 and is now an Agri-Food and Biosciences Institute (AFBI) research station. 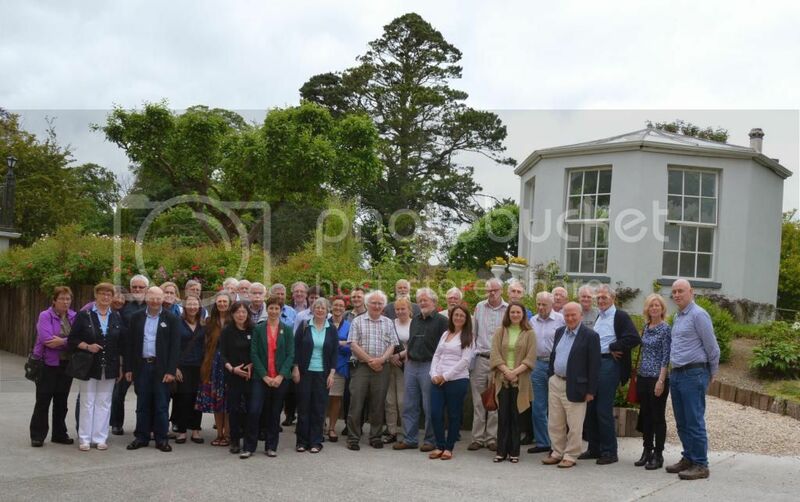 Participants were welcomed by the Director, David Johnston, who outlined the history of the house and the main research carried on by AFBI in the extensive grounds and research facilities of the demesne. 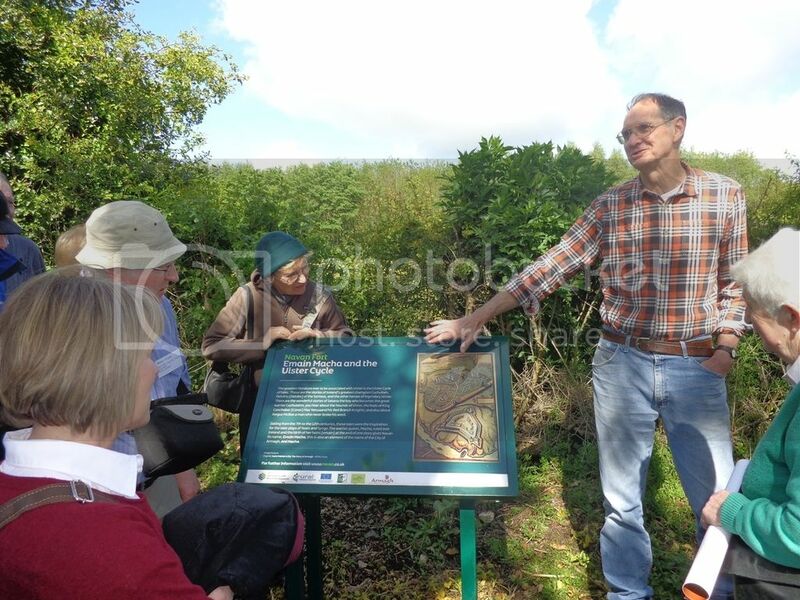 This, and the subsequent tour of the facilities, were indeed an eye-opener, especially for those from the Republic of Ireland who had little or no knowledge of the importance of Loughgall from an agricultural research perspective and, indeed, in the context of Irish history. The village of Loughgall lies close to the site of the Battle of the Diamond (1795), after which the Orange Order was founded in the village. This development will soon be marked by a major new facility supported by the EU’s PEACE III Programme. After partaking of food and refreshments, participants went on a tour of the research facilities under the guidance of AFBI research staff. 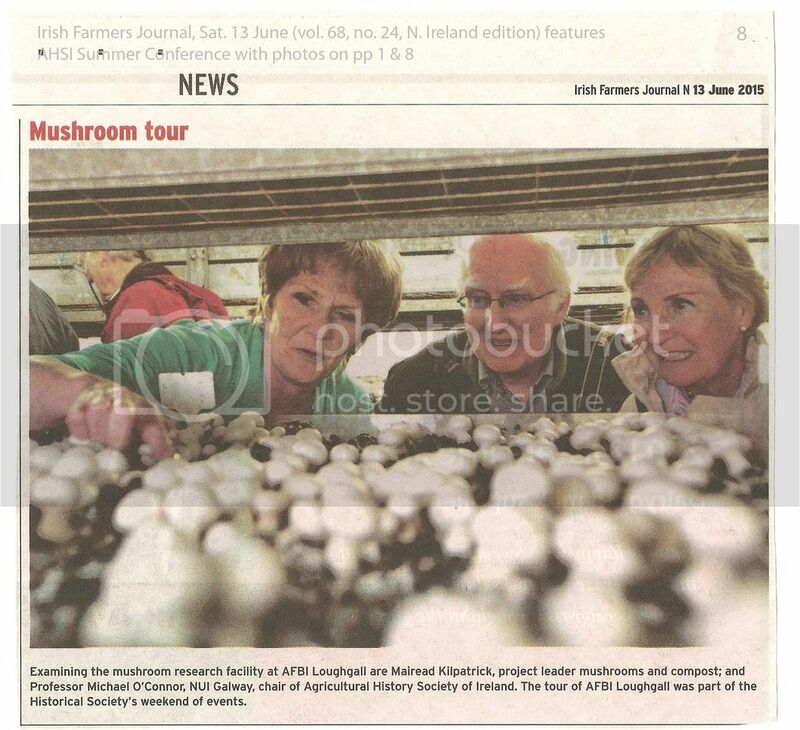 Mairéad Kilpatrick, the AFBI mushroom expert, introduced us to the latest advances in mushroom growing, including on-going research aimed at reducing the time between ‘seeding’ of compost and harvesting of mushrooms for market. Loughgall is at the centre of the ‘Orchard County’ and so, not surprisingly, research into apple growing, and especially the Bramley, is of major importance. 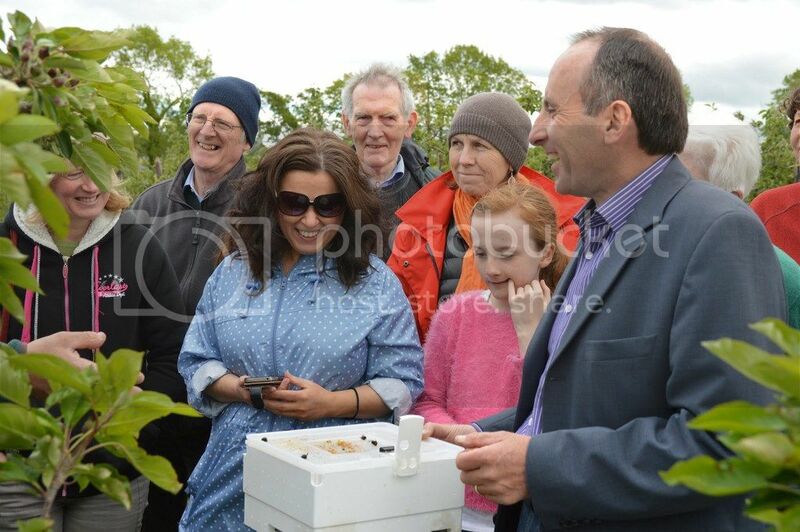 Seán Mac an tSaoir made us aware of the exceptional local climate and especially the low incidence of late spring frosts that have facilitated apple-, and more recently pear-growing, in this part of Co. Armagh. He elaborated enthusiastically on the joint efforts of the AFBI and local producers to keep this long tradition alive without any financial incentives from the EU. The industry is important not only locally but also in wider spheres; for example, most of the juice used by Bulmers/Magner cider-production facility in Clonmel, Co. Tipperary, comes from Armagh apples. After that it was on to bio-fuel production based on willow cultivation. The intricacies of growing and delivering this new farm product and, indeed, identifying strains best suited to Irish conditions, were described to us by Linda Walsh as we stood beside stands of young willow and stacks of cut willow left to dry. The importance of connecting producers with local end-users was emphasised. Then we were back to glasshouses and polytunnels, and research into improving potatoes and ryegrass. We were amazed to learn from Paul Watts that Northern Ireland was, and still continues to be, a major source of seed potatoes for early crops in much of southern Europe and especially Cyprus. In other words, growers in these warm southern climes, import ‘seed’ potatoes from Ireland prized on account of being largely disease-free) and later export the early crop to Ireland and other parts of NW Europe. After that, it was the turn of the Director, David Johnston, to show us the facilities being used to breed, propagate and test new varieties of rye-grass (Lolium). From a historical viewpoint, it was surprising to learn how quickly the importance of grass-seed as a trade commodity in Northern Ireland declined, mainly in the closing decades of the last century. After that, it was the short journey to Armagh city, where most booked into the Armagh City Hotel and began meeting those who were not lucky enough to have experienced at first hand the hospitality and overviews given by the staff at AFBI earlier in the day. The day began with registration at 9.30 h, followed by Welcome and Introduction by Jim McAdam (AFBI). In the session that followed, chaired by J. McAdam, lectures by the two MBs — namely Mark Bailey, astronomer and Director of Armagh Observatory, and Mike Baillie, dendrochronologist and palaeoclimate expert at QUB — provided thought- and discussion-provoking information on climate and farming in Ireland and indeed globally during recent centuries. After coffee break came session two, chaired by Fiona Beglane. In this session, Meriel McClatchie provided us with a fascinating overview of the history of flax in Europe and informed us about recent important macrofossil evidence for an exceptionally long history of flax growing in Ireland, beginning in the early Neolithic (shortly after 4000 BC). This was followed by lectures by Jonathan Bell and Mervyn Watson. 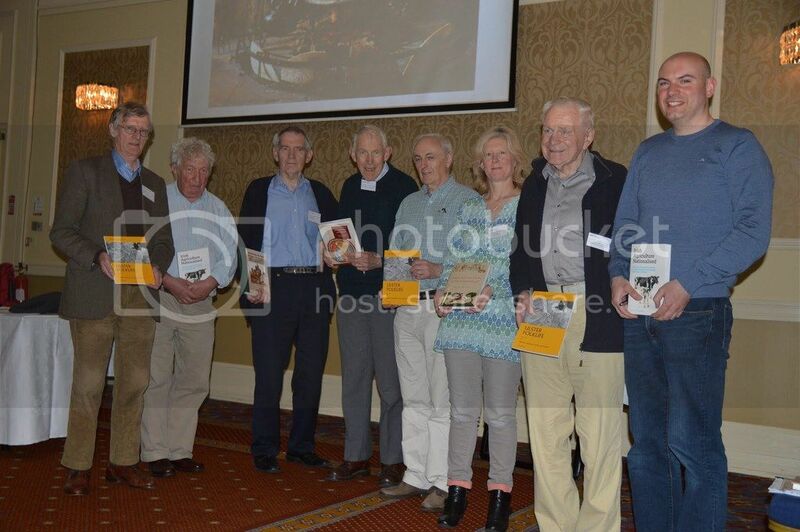 This time, however, this well-known duo gave separate presentations drawing on their long experience at the Ulster Folk and Transport Museum and personal researches. J. Bell spoke on the role of flax in the farming economy of Ulster in pre- and post-Great Famine times, while M. Watson discussed the role of the spade versus the plough during the same period, mainly with reference to Co. Armagh. The importance of Alexander Yule, agricultural advisor to the Church of Ireland Archbishop of Armagh and strong advocate of the spade as the preferred implement for arable farming, was highlighted. After a good lunch and posters (the subject matter related mainly to AFBI research at Loughgall; see Abstracts), session three, chaired by Michael O’Connell, got under way. 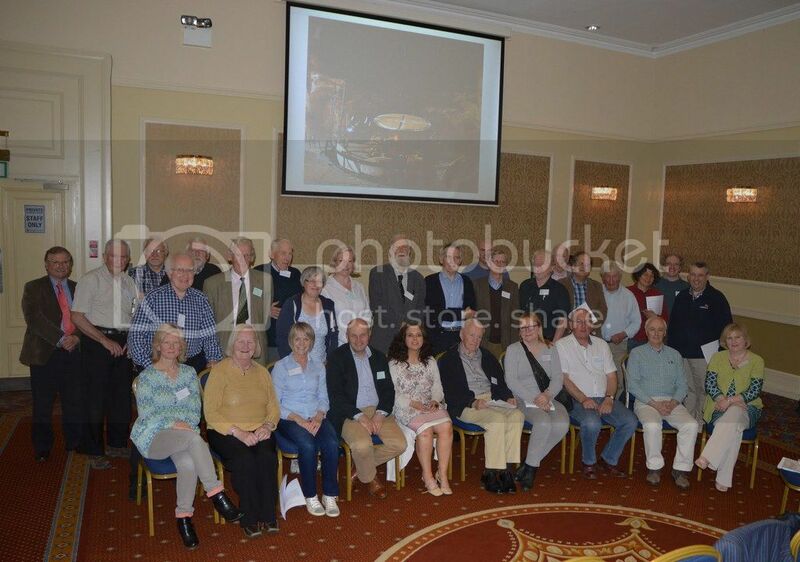 This session consisted of contributions based mainly on AFBI research and included (a) willow cultivation and biomass cropping by Malcolm Dawson, an expert non only on this topic but also the history of Loughgall Manor House and the former long-term owners, the Coote family, and (b) the grass-seed industry in Ulster by David Johnston. As already indicated, this industry, once so important locally and indeed in British/Irish contexts generally, has been, since the late 1940s, in severe and, it would appear, irreversible decline. However, research continues at AFBI, Loughgall into achieving grass strains that are optimum for Irish farming. This is important given that grass is by far the single most important ‘crop’ in Ireland today. This session was brought to a close by a contribution from Graeme Cross, top fruit adviser of CAFRE (College of Agriculture, Food and Rural Enterprise), on the history of apple growing and cider production in Ireland and the challenges and opportunities facing these industries. The afternoon after-coffee-break session was chaired by Matthew Stout. In this session, we were treated to a most informative and interesting lecture by Regina Sexton on hardening stands, mainly of iron but also of wood, which were traditionally and widely used for toasting the oatcake, a form of biscuit widely prepared in households prior to the commercial large-scale production of biscuits by large firms such as Jacobs. This was Regina’s second public appearance that day, having earlier contributed to the RTE radio 1 programme, The Business. Indeed, AHSI members were prominent in the media on that Saturday morning. Jim McAdam and Mervyn Watson had a substantial interview in the prime-time early morning programme Your Place and Mine on BBC Radio Ulster during which they had the opportunity to highlight the AHSI conference taking place in Co. Armagh. Beglane, F. (2015) Anglo-Norman parks in medieval Ireland. Four Courts Press, Dublin, 227 pp. 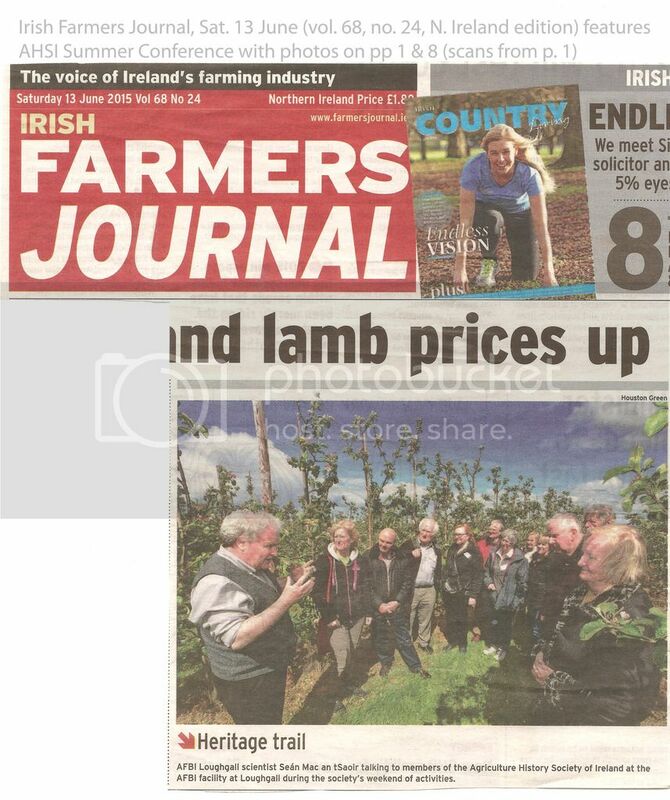 Ó Fathartaigh, M. (2015) Irish agriculture nationalised. The Dairy Disposal Company and the making of the modern Irish dairy industry. Institute of Public Administration (IPA), Dublin, 340 pp. Collins, J.F. (2008) Quickening the earth: soil minding and mending in Ireland. UCD (School of Biology and Environmental Science), Dublin, 510 pp. 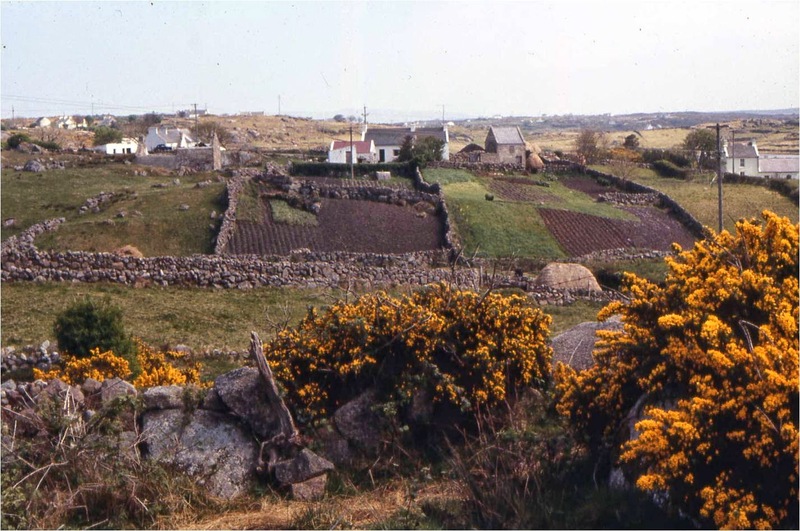 Murphy, M. & Stout, M. (2015) Agriculture and settlement in Ireland. Four Courts Press, Dublin, 226pp. Many of the conference participants availed themselves of the above titles at discounted price or, in the case of Quickening the Earth, as a complimentary book (thanks to the author, Jim Collins). Navan Fort proved a real treat thanks to excellent weather and the superb guiding provided by Jim Mallory (Professor emeritus, Archaeology, QUB) and Meriel McClatchie (postdoctoral fellow and archaeobotanist with extensive research experience in UCC, UCL (London), QUB, UCD and now once again in UCC). 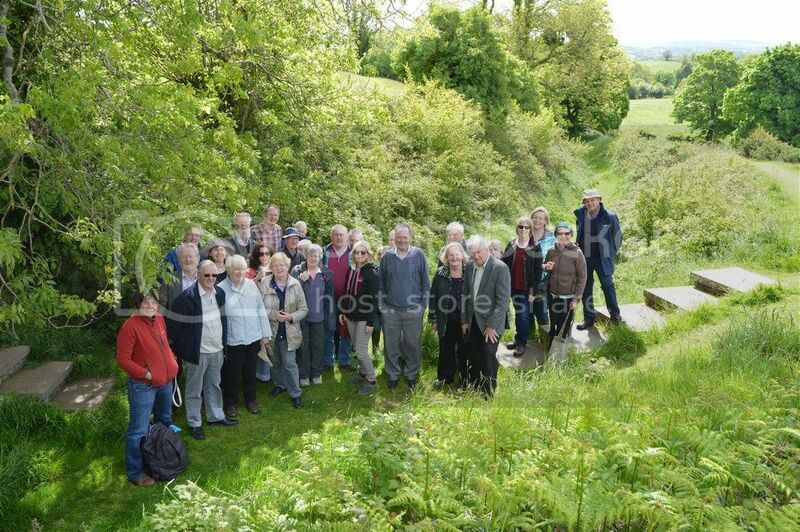 Folklore, archaeology and ancient farming (especially arable farming) at Navan Fort and nearby Haughey’s Fort were discussed at considerable length, in a superb outdoor setting of rolling landscapes bathed in bright sunlight. After the formal presentations and before lunch, participants investigated the interesting exhibits at the Centre, looked at the audio-visual presentation or simply played at being Celts in the Iron Age, i.e. pre-Christian Ireland, under the tutelage of a highly knowledgeable guide. After lunch at the Navan Fort Centre, we visited Bramley Farm where our host, Dermot Morgan and his daughter, Cara, gave us a guided tour of the family-run orchards that include several hectares of modern, high-density apple-tree plantations (mainly Bramley) and also some fine specimens of old apples trees, some probably over 200 years old. Apple cultivation is more sensitive to weather than most other types of farming as was clear from the failure of much of the apple blossom to set seed due to severe, late-spring frost this year, at a critical stage of flower/seed development. Champagne and Italian Parma Ham. 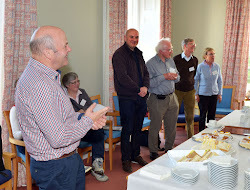 Thus ended the AHSI 2015 conference but not before thanks were expressed by AHSI chairperson, Michael O’Connell, to the local organisers, Professor Jim McAdam and Frances Ward of AFBI, for the substantial time and trouble taken in organising what was a memorable event. AHSI is also indebted to AFBI (Loughgall) for the enthusiastic support given to the conference; without that support, and the important contributions of its Director, David Johnston, and his staff, the conference programme simply could not be delivered. And last but not least, thanks to the loyal members and friends of AHSI who travelled from literally the four corners of Ireland to participate in, and contribute to, the AHSI summer conference 2015. To one and all, míle buíochas!